Rexton Hearing Aids Reviews - Are They Worth The Price? UPDATED November 2, 2016 – Rexton Hearing Aids Reviews provides customers with a detailed overview of Rexton hearing aids. Continue reading Rexton Hearing Aids Reviews for full model analysis. Rexton hearing aids are among the most appreciated such devices. Rexton offers the full range of hearing aids, from ITE to BTE, or from CIC to Full Shell. Their products are exclusively digital, which means that they convert analog sound waves into digital signals. The main advantage of being digital is that they can distinguish between noises and speech. Allowing human voice amplification and simultaneously noise reduction. The Rexton hearing aid Onyx+ is the company’s longest lasting high performance hearing aid. This Receiver-in-Canal (RIC) hearing device provides users with a wide fitting range, to suit almost any hearing requirement. The Rexton hearing aid Pico hearing aid is a Completely-In-The-Canal (CIC) hearing device that fits deeper into the second bend of the user’s ear canal. Making it completely invisible, and also remaining comfortable. This hearing aid is Rexton’s most discreet, and smallest hearing aid, with a faceplate that is only 11 mm tall. Rexton hearing aids Stream+ hearing aid is a comfortable hearing aid that sits in the helix of the user’s outer ear. It provides an occlusion-free, custom-feeling and open fit to the user. This Rexton hearing aid is available in multiple colors. Users can find the hearing aid that works best for them. The Rexton hearing aids Insite+ is one of the more advanced hearing aids. It is a Receiver-In-The-Canal (RIC) hearing device designed to deliver excellent sound quality to users. It allows for wireless connectivity to users’ electronic devices, allowing for enhanced hearing enjoyment with a multitude of electronics. The Rexton hearing aid Cobalt+ is an advanced Receiver-In-The-Canal (RIC) hearing device providing users with an instant, comfortable fit. This Rexton hearing aids delivers exceptional speech understanding and more advanced hearing of a wide variety of other sounds. The device also allows for easier hearing of the user’s electronic devices. The Cobalt+ hearing aid is available in a color to match a variety of hair and skin tones. The Rexton Gem+ hearing aid is a discreet Receiver-In-The-Canal (RIC) hearing aid with numerous advanced features. Helping deliver superb hearing quality sound to users. This Rexton hearing aids device automatically adjusts to the user’s hearing environment. This automation allows less manual adjustments made to the instrument. It is available in a variety of different colors matching the skin and hair color of just about any user. Rexton hearing aids Bridge+ hearing devices are a series of RIC or ITE hearing devices that deliver a comfortable and reliable fit to users. The RIC units of this series come in a variety of different colors to match hair and skin tones. Although the styles of the Bridge+ hearing aids vary, the technology available is the same for each device. Rexton hearing aids Day+ hearing aids are a series of high-quality, minimal maintenance Receiver-In-The-Canal, Behind-The-Ear, In-The-Ear, and Completely-In-The-Canal hearing devices. Designed to suit a broad range of hearing losses. With numerous features built into each instrument, the Rexton hearing aid Day+ delivers exceptional sound quality. Although the Day+ hearing aids are available in four different styles, the technology in the devices is mainly the same. The Rexton hearing aid Arena is a central Behind-The-Ear digital hearing device. This device delivers flexibility that is not typically found with conventional analog hearing devices. The Arena hearing aid provides users with essential listening needs, is both reliable as well as affordable. This Rexton hearing aids device is available in a variety of product levels for a full range of hearing loss. Rexton Hearing Aids Reviews another state-of-the-art hearing aid from Rexton is the Gem Miniature receiver-in-the-canal. Featuring SoundSmoothing, a function that makes a distinction between transient noises and speech, thus offering the user more comfort. Additionally, the automatic and adaptive directional microphone has the capability to focus on the sounds you want to hear. Attenuating the others, as in the case of several people speaking at the same time. All Rexton hearing aids feature a new generation of automatic feedback cancellation. This feature helps eliminate the annoying feedback even before it can be detected by the human ear. The more advanced hearing aids models like Gem 12, Cobalt 12 and Cobalt 16 include an automatic equalizer. The equalizer optimizes the sound quality according to the listening environment, without any intervention from the user’s side. All Rexton hearing aids are so small and discreet that they are virtually invisible to other people. Making the hearing impaired persons feel less embarrassed by their condition. 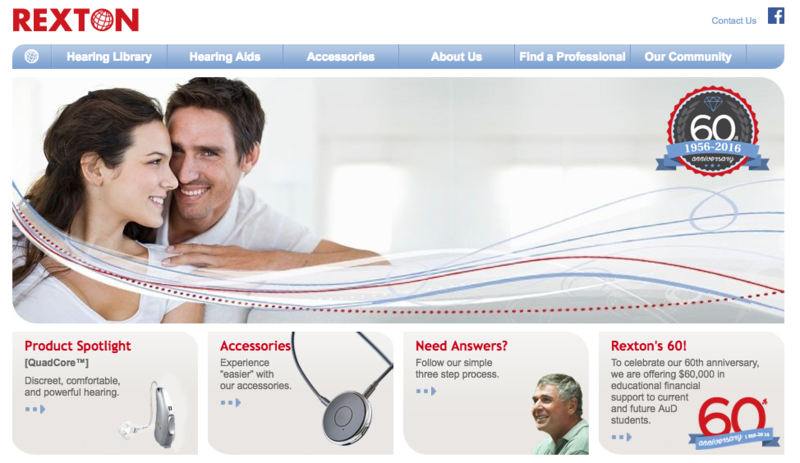 If you would like to review on other hearing aids then check the page hearing aids reviews. For Rexton Hearing Aids Reviews complete model overview visit Hearing Reviews.com. I am trying to find someone in Oakland County Michigan who can adjust my 90 year old dad’s Rexton hearing aids. There is no customer service available and they do not answer their emails. Do you have any idea how I can get information about adjusting Rexton hearing aids in Michigan? I purchased Rexton aids at Costco. If the Costco store in your locality has hearing aids they might be willing to adjust. My mom has a Rexton Hearing Aid purchased from Costco, needs a repair. Please Let me know where I can mail it to to fix it. I do not want to drive to Costco, it is very far from me. Please let me know ASAP! I am trying to stay positive re my new hearing aids. However I have hit a very high defective rate! The first aid I was given had to be replaced due to amplifer problems according to the Costco rep. But now the first aid for the other ear is defective, same problem. Has anyone else had this problem with Rexton aids? Do I need to change manufacturers? I have a Rexton in the ear hearing aid that is now back at the factory for the 4th time in a little over a year. Costco has been good about furnishing me with a loaner behind the ear that gets me by. I am very concerned about the quality of the Rexton unit. I have been wearing aids for over 30 yrs. and have never experienced the trouble I am having with Rexton. I PURCHASED A PAIR OF REXTON FROM A HEARING AID CENTER IN LEBANON TENNESSEE. AFTER SEVERAL MOUNTHS OF TRYING TO GET THEM ADJUSTED WITH NO SATISFACTION. THE CENTER DOES NOT TAKE THE TIME TO SOLVE MY PROBLEM. WHERE ELSE IN MIDDLE TENNESSEE CAN I GO TO GET MY HEARING AIDS ADJUSTED. SOMRONE WHO WILL TAKE THE TIME TO DO IT RIGHT. $5200 and 18 months later, I still can’t hear a conservation with a person sitting next to me. Can’t hear the preacher in church, conversation on the telephone. Wish I would have got the “Loud & Clear” as advertised on TV. I bought one at Costco for $1800. Wasn’t happy, so went to a Starkey dealer and paid $5500. It was slightly better than Costco’s but not worth the $3700 difference. Returned it before 30 day free trial but it was not easy to get the money back. Went back to Costco’s for their new Rexton Trax 42. I should get it within a week. I will let you know how it works out. I myself just got the Rexton Trax 42 and having some difficulties ….will be going back for adjustments. Just wondering how you are doing with the Rexton 42 so far? If the center won’t fix the issue then write the headquarters of the manufacture. Give then all the details of what you have gone through and be sure to tell then that word of mouth can be a powerful selling point or a powerful deterent to purchasing from them. I bet you will get your problem solved. to replace the wire tubing on my hearing aid. How much does it cost? Please help. Thanks. Interesting comments – I just purchased hearing aids at Costco; my contract says if I am unhappy with them “FOR ANY REASON” I can return them within the first 90 days. I paid $2600 for both aids. I can see from below, that if I am unhappy with them in the next 30 days, I will indeed demand full money back. They should be here before the week’s end. I hate that there is no phone support for the Rexton products. I have hearing aids and a Smart Connect device. The Smart Connect is a necklace pendant that connects the hearing aids to my phone and allows receiving phone calls and listening to music via the hearing aids. The problem is that if I turn my head while listening to music or on a call, the sound cuts out of at least one ear. It becomes impossible and this defeats the purpose. Costco told me that it was a software bug that a fix was planned for. That was 2 or 3 months ago. I would like to call Rexton, but good luck finding a direct number. I just filled out a webform to try to get an answer. I have asked the Costco rep to inquire as well. I just hate wearing the Smart connect knowing that when it cuts out like that, I will be unhappy again. My wife received the Smart Connect at Costco and has the same problem. They said the cord was too long, but they don’t make a shorter one. She shortened it with a rubber band, but it still happens time to time. They gave her a loaner while they sent it in to Rexton for repair and it actually works. Rexton said there is nothing wrong with hers and refused to fix or replace it. For what it cost it should not be so flaky. My Costco contract says I have a 180 day trial period. My wife like her Trax42 so I bought a pair. I also have new Rexton aids and they are terrible. Had to replace my 7 year old ones of a different brand which were so much better. I’ve had several adjustments made but to no avail. I’ll buy something else as these are unusable.